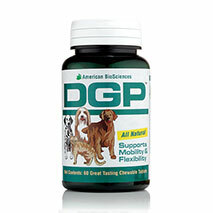 Many dogs and cats like the taste of DGP: Pet Joint Health Support and will eat the tablet by itself. However, if your pet is a picky eater, we have alternative solutions on administering DGP to your pet. Pill maskers, more popularly known as pill pockets, are treats that have been hollowed out so that you can insert pills and other medicines to administer to your pet. You can buy them from most pet stores, or there are numerous recipes online that you can reference to make your own homemade pill masking treat for your pet. You can grind DGP up and sprinkle it over your pet’s regular food (wet or dry, it does not matter). It is easiest to grind with a mortar and pestle, but you can use other tools. For dogs, wrap it in a piece of thinly sliced lunch meat, peanut butter, or cheese. Please note that you should not give dairy to cats! We recommend wrapping it in lunch meat or fish for them. As with any “human” food, make sure that your pet does not have a sensitivity or allergy to it before giving it to them in larger quantities. You can also consult your pet’s vet to confirm what is and isn’t safe to give to your pet. If your pet is on a restricted calorie diet, or the above methods haven’t worked, you can “pill” your pet. Gently take your pet’s head and tilt it up, forcing their jaw open. Drop the pill in the back of their mouth and then gently stroke your finger on their throat so they swallow the pill. Remember that this is just as unpleasant for your pet as it is for you, so be gentle and talk to them when you use this so they remain calm. DGP can help your pet in their old age with mobility and getting around. However, it must be given consistently for it truly to work! Try these tips to get your pet to take their DGP and see the difference in as little as seven days.